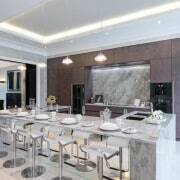 In today’s modern living, open plan kitchens and dining room environments have become extremely popular. 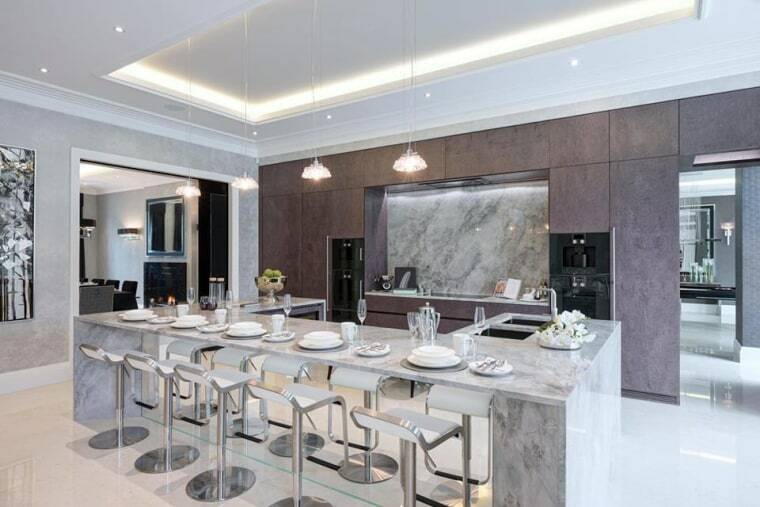 These large spaces are the most used spaces within homes, where a variety of tasks are performed from cooking to intimate dining and entertaining. Creating zones within these spaces can be challenging, and lighting designers can offer expert advice and direction in order to add high value, by introducing innovative LED lighting solutions that really make an impact. This is achieved by creating different lighting zones in these open plan spaces. Changing our mood, depending on the function, at the click of a switch. The kitchen has to work hard as a room, to function efficiently throughout the day and accommodate all the activities that are carried out on a daily basis. Background lighting is essential to provide general indirect lighting. Many people make the common mistake of lighting the walk ways instead of work tops, leaving them in darkness. The best way is to align downlights with the cabinet doors, directing the light towards their surface to create a soft, reflected light. Using uplighters on top of cabinets in kitchens that have high ceilings is also a brilliant way to reflect light off the ceiling to make a diffused glow. Colour tuneable lights are extremely useful in the kitchen area for crisp, bright light for daytime to soft yellow light for the evening. For freestanding kitchen units, using LED strip lighting beneath give a beautiful effect of them floating and adds layers of light. 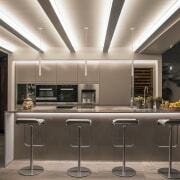 LED strip lighting is also perfect to use on kitchen islands to achieve the same look. To avoid dirt collecting on fittings that cooking creates, always opt for recessed or semi-recessed fittings. By manipulating light in the kitchen, it becomes an amazing tool in creating visual barriers and defining zones. In the dining area you want it to feel intimate and cosy. To create this ambience, you should leave the space in edges of the room dim and highlight the table. The focus should be upon the centre of the dining table, placing a pendant or chandelier here adds a decorative touch. They should also match the table it is above; a circular chandelier marries nicely with a round table. 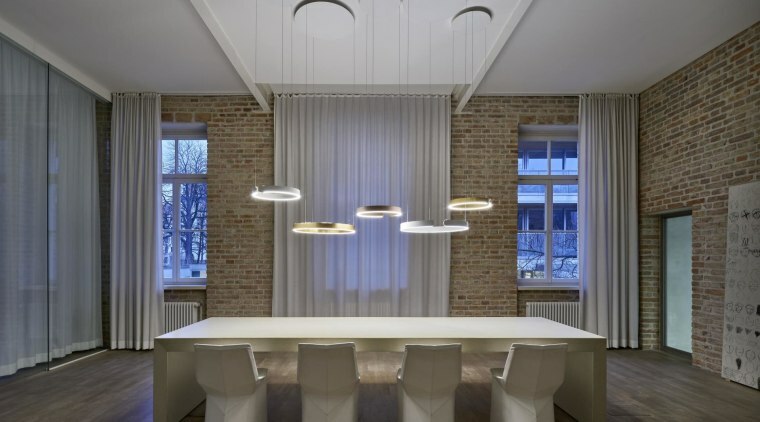 For a long rectangular table, linear pendants are best to echo the shape. Having this focal pendant on its own circuit is great, so it can be dimmed for a gorgeous glow. In this area you want it to feel intimate and cosy, to create this you want to leave the space in edges of the room dim and highlight the table. Having low-glare downlights allows any silverware or crystal to sparkle whilst still having a relaxed ambiance. Bear in mind, you may want to use this area for other functions such as a workspace and reading, so having dimmable lights are a perfect solution to maximise the use of the space. It is recommended that a much softer lighting effect is created to take away the harsh glare the recessed downlights typically give. We want this zone to feel more relaxed, after the hard work of cooking, it is now time to unwind and put your feet up. Using seamless plaster-in profiles allows for a very diffused indirect light to be washed around the ceiling, defining the relaxing area. These profiles are designed to be fitted into the plaster board ceiling, completely flushed to maintain your ceiling height. This seamless solution creates another depth of lighting and a range of LED tapes can added within the profile. 2700k lumens is a perfect light temperature to create a warm feeling or even using colour change RGB tape to add drama and mood within the space. Alternatively, a surface mounted coving which is fixed to the wall, approximately 300mm down from the ceiling, creates a gorgeous halo lighting effect. The LED tape is placed in the coving to add a frame of diffused light to the zone. A centrally placed pendant with diffused fabric is a brilliant way to incorporate softer features and reduce a kitchen’s hard edges. An excellent way to add a splash of colour to the space.